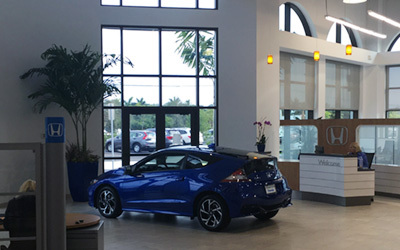 Coconut Point Honda in Estero, FL, serving Cape Coral and Fort Myers, FL, is thrilled to be your provider for all your automotive needs. Our Honda dealership serves you with new Hondas, Certified Pre-Owned Hondas, used vehicles in a wide variety of makes and models, new and used auto financing, vehicle service and repairs, and Genuine Honda parts. As the latest addition to the Hanania Automotive Group, we're part of an organization that has been a leader of customer service at eleven other dealerships for over 30 years, and we're proud to bring our exceptional service to Estero, Cape Coral, and Fort Myers, FL. From the moment you step into our state-of-the-art showroom, you'll be met by a friendly sales team determined to make you its number-one priority. It's okay to gaze around the open-concept design of our showroom; we're quite fond of it ourselves. However, as impressive as that is, wait until you see our new or used auto inventories. Our sales representatives have a keen intuition that allows them to listen to your wants and needs to help you find the car, truck, or SUV that perfectly suits your lifestyle. Then you'll meet with our on-site finance staff. These number-crunching experts tap into our network of trustworthy lenders to find new or used auto financing that won't break your budget and won't require you to go loan rate shopping at other banks. Once the keys to your new ride are in your hands, we don't stop there. Our top-notch service team strives to keep your vehicle running in peak condition for years to come with regular maintenance, auto repairs, and Genuine Honda parts. Our 24 high-tech service bays will come in handy because we provide a 2-year/24,000-mile complimentary maintenance program with any new Honda purchase! While you wait for your vehicle, get comfy in our plush customer lounge with free Wi-Fi and let the kids hang out in the children's playroom. If you need to do some work, we have a quiet area set aside for you as well, and with any service department work, you'll receive a free car wash. While we are open seven days a week, you can always shop 24/7 on our website! Browse our new or used inventories, apply for financing, value your trade-in, schedule service, or order parts from the convenience of your own computer. We can't wait to see you at our dealership located at 22240 South Tamiami Trail, Estero, FL 33928, and you can reach us by phone at 866-241-3549. We look forward to taking care of all your automotive needs!